Hi, I am interested in your 1954 Chevrolet 210 (stock #MHM3152.1) listed on Autotrader for $15,900. I'd like to get more information about this vehicle and confirm its availability. 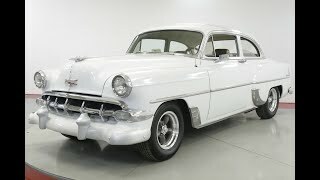 Worldwide Vintage Autos is pleased to present this 1954 Chevrolet 210. The Chevrolet Two-Ten, or 210, was the midrange model of the Chevrolet car from 1953 to 1957. It took its name by shortening the production series number (2100) by one digit in order to capitalize on the 1950s trend toward numerical auto names. The numerical designation 210 was also sporadically used in company literature. It replaced the Styleline DeLuxe model available in previous years. The Two-Ten was discontinued after the 1957 model year to be replaced by the Biscayne.